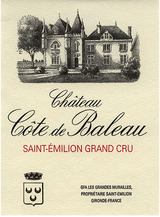 The 2015 Côte de Baleau has a refined and intense bouquet with precise black and red fruit, seamlessly integrated oak and a sense of terroir coming through. The palate is medium-bodied with fine tannin, well-judged acidity and plenty of finesse and poise towards the finish. This is such a pretty Saint Emilion that you almost overlook its length and persistence. It is one of the best wines that I have tasted from the estate. Just as it was en primeur, the 2015 CÃ´te de Baleau is pure class. Silky tannins, lifted aromatics and soft, caressing fruit meld together to inform a super-polished, elegant Saint-Ãmilion that speaks with a hushed, sensual voice. Readers who appreciate the more restrained side of Bordeaux will find much to admire. This has a juicy core of crushed raspberry, boysenberry and red currant fruit that has melded already with singed mesquite and iron threads. Best from 2020 through 2030. - J.M.